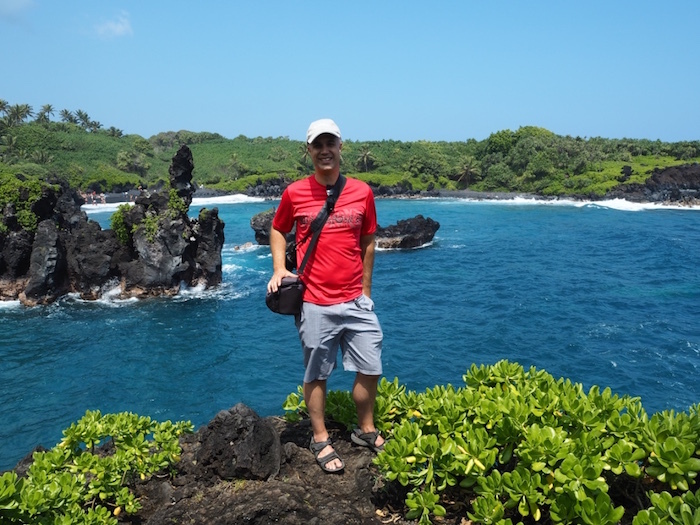 On our trip to Maui, we drove along the famous and scenic Road to Hana. 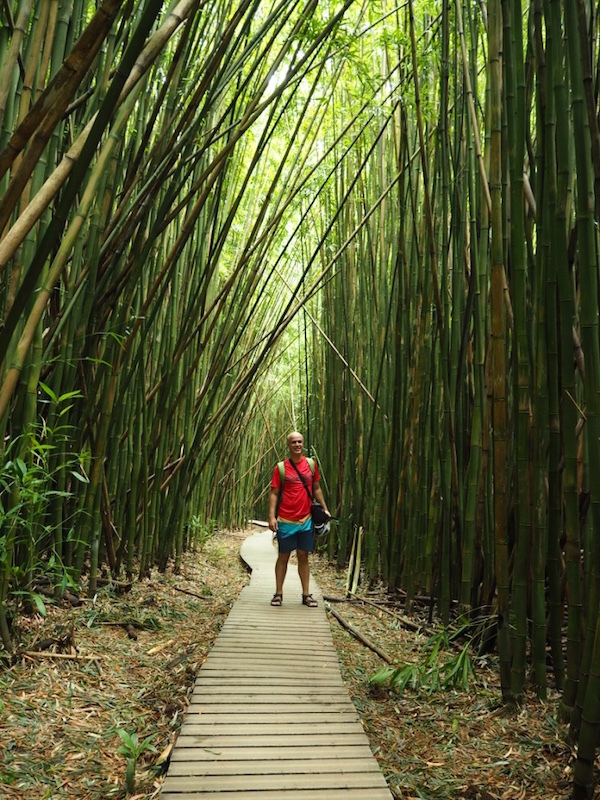 The Road to Hana is one of the most breathtaking drives in America and is the number one attraction on Maui. 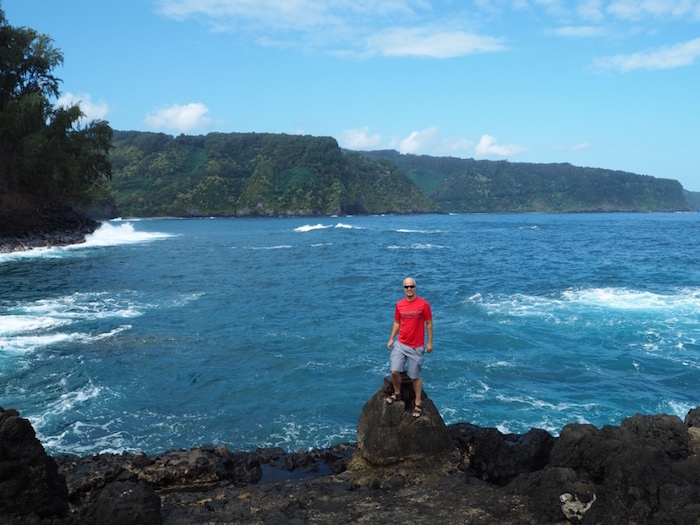 There are two ways to tackle the Road to Hana. You can hire a car and drive it yourself, or you can take an organised day tour. We opted to drive ourselves and we think it’s the way to go if one of you doesn’t mind driving. There is so much to do on the Road to Hana; by driving you get to stop where you want to, not where the tour guide decides to take you. Doing some research beforehand always helps! Of course, if you decide to drive it yourself, be aware that this is not the easiest drive. The drive is fifty two miles on the famous Hana Highway (HWY 36). It doesn’t seem like a lot but the fifty nine one way bridges and six hundred and twenty hairpins sure make it interesting! Without stopping it would take about three hours but believe me not stopping would be a crime! 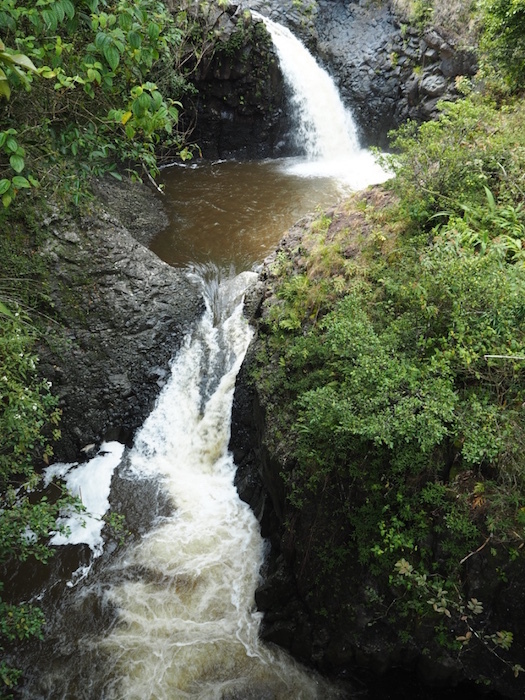 The best bits about driving the Road to Hana are all the stunning sights to stop at along the way. 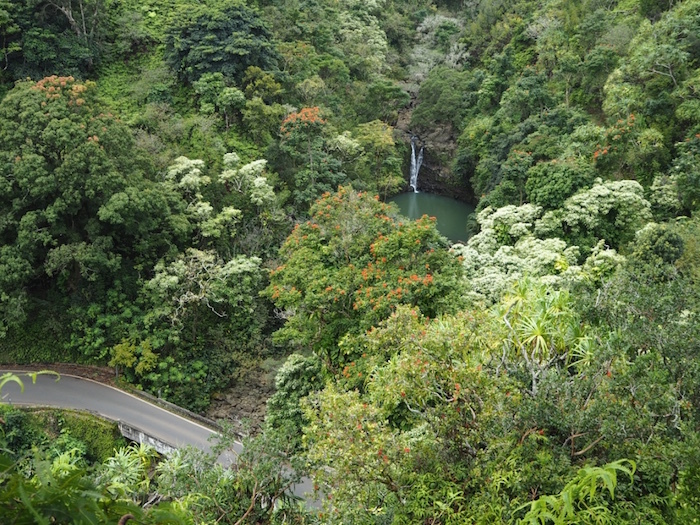 View over Pouhokamoa Falls and the Road to Hana from the Garden of Eden. There are many stops to be made. And unless you stay overnight in Hana (which would be a great option) it is impossible to see them all in one day. So if like us you only have one day, here is a list of the places that you just shouldn’t miss. 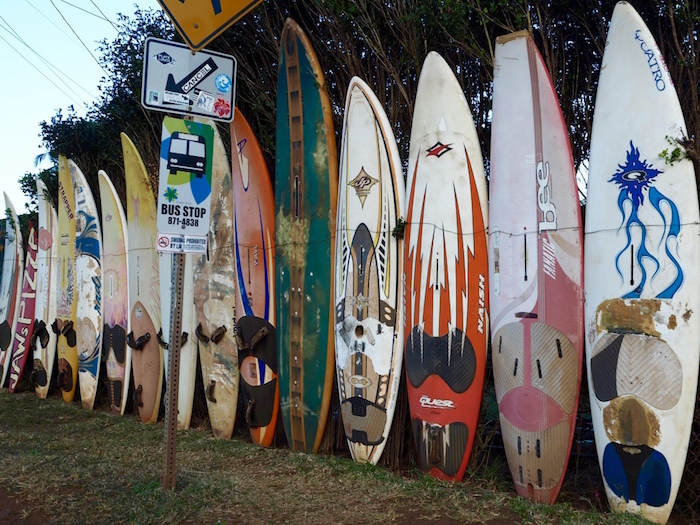 Paia – Paia is a hippie town and the first stop along the road. 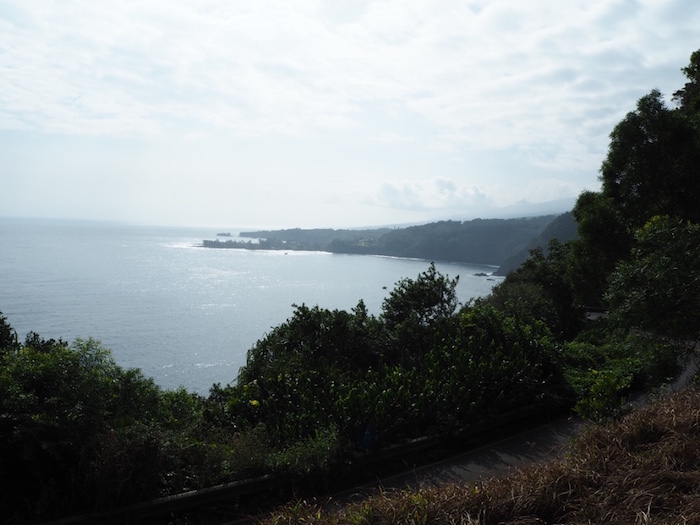 It is also the last town before you reach Hana. After Paia there are no more petrol stations until Hana so make sure to fill your tank before you leave there. Grab breakfast and a Picnic lunch at the Kuau Store outside of town. They make good coffee, great breakfasts and delicious picnic lunches. The surf board fence outside of the store is also worth a few photos. 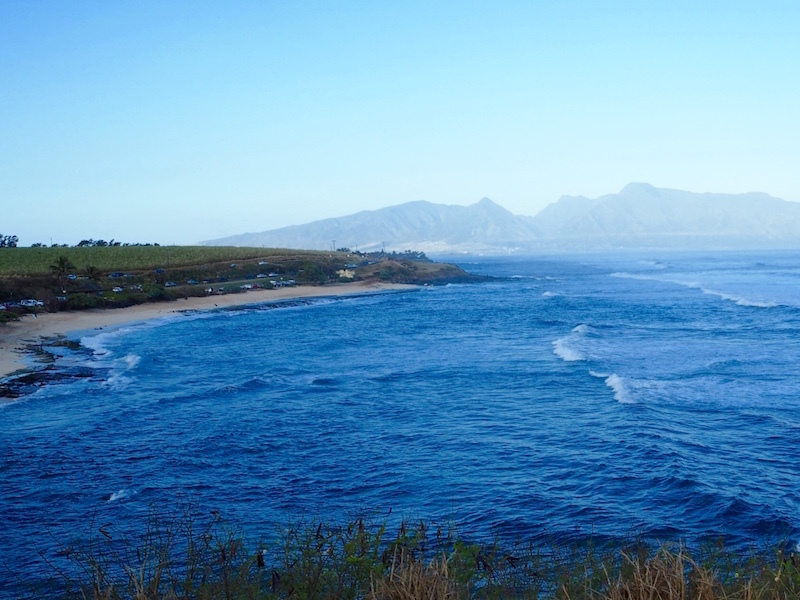 Ho’okipa lookout – Ho’okipa beach is a few minutes past Paia. It can get massive waves in winter and is very popular with experienced surfers. It’s worth stopping for a few minutes just to check them out. The Garden of Eden (mile marker 10) – This arboretum is stunning and totally worth the stop. It isn’t very big and you only need approximately forty five minutes to an hour to explore it. The entrance fee is $15 per person. The grounds are really well kept and there are many photo opportunities. 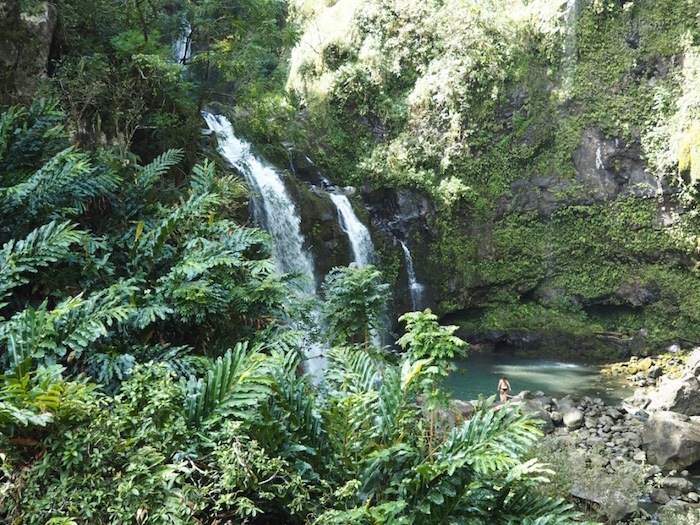 Puohokamoa Falls, a bamboo forest, panoramic ocean views, and one hundred years old mango trees can be found in the garden. 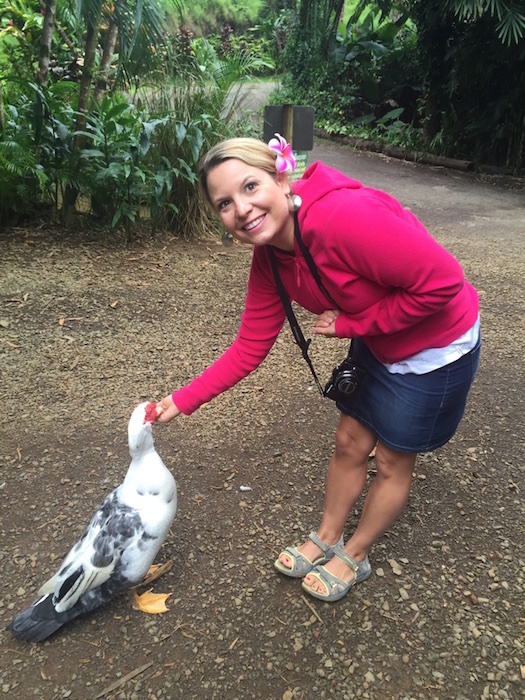 And of course there is the duck feeding! Kaumahina State Wayside Park (mile marker 12) – This park is good for a quick photo stop to catch a great view of the North’s coast. 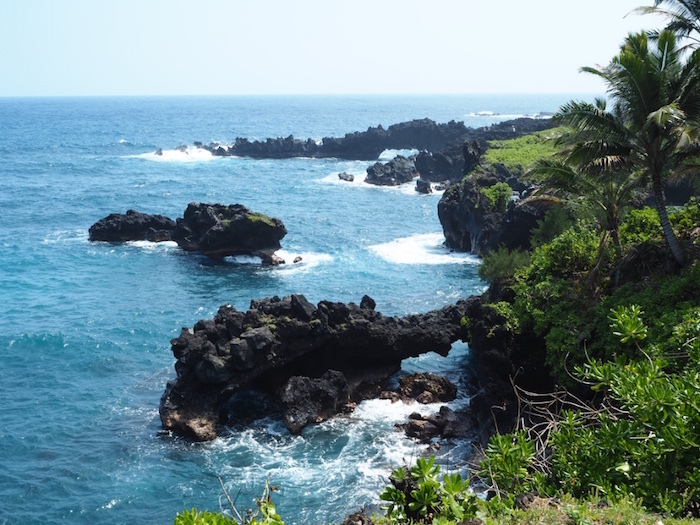 Keanae Peninsula and Village (Road turning on the left past mile marker 16) – Keanae is a traditional Hawaiian village and it offers stunning coastal views, black lava rocks and an old stone church built in 1856 which survived the tsunami of 1946. This area is really wild and swimming is forbidden. But it’s a great place to take a break and watch the waves crashing onto shore. 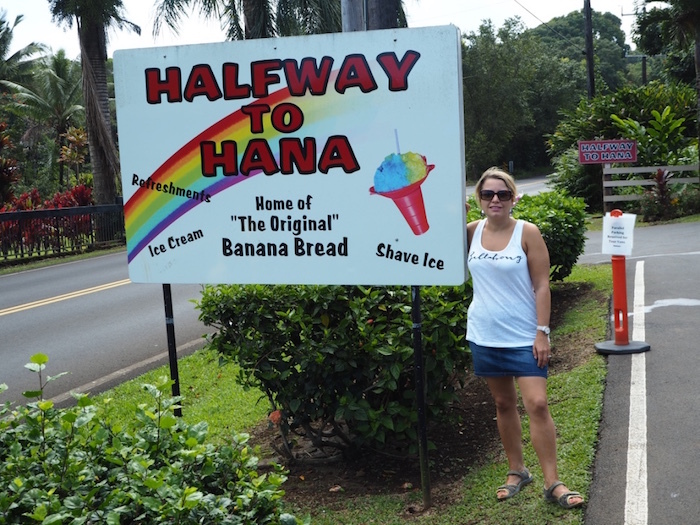 Half Way to Hana Stand (mile marker 17) – Time for some delicious banana bread still warm and fresh from the oven! Mmm. Stand half way to Hana. Yummy Banana bread! Upper Waikani also called Three Bears Falls (mile marker 21) – These very pretty waterfalls are found just by the side of the road. Many cars will be stopped there so you can’t miss it. With only a few parking spaces, it can be hard to stop but you can park a bit further up the road and walk back down. 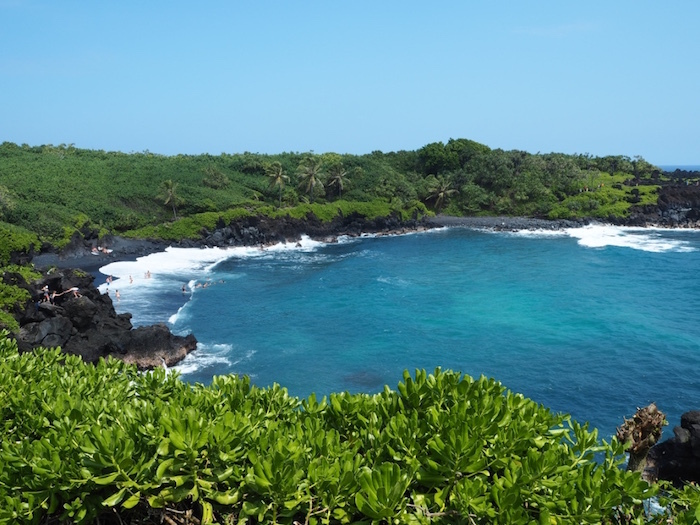 Waianapanapa State Wayside Park (mile marker 32) – This park is definitely a must see. 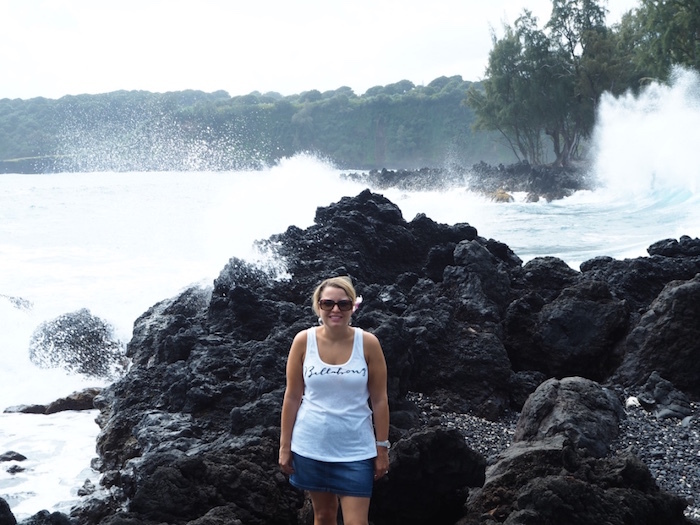 You will find the only black beach on Maui and some stunning volcanic scenery. Other attractions in this park are the cave, the blow hole and the lava tubes. We spent over an hour there taking lots of photos but you could easily spend two or three hours if you wanted stay and relax on the beach for a while. It’s a great place to do just that! Once you reach Hana you should keep on going. There are more amazing things to see further on! You will get onto the Piilani Highway (HWY 31) and the mile markers will start counting down. Hana itself is not really anything special. If you already have food then I would just keep going. 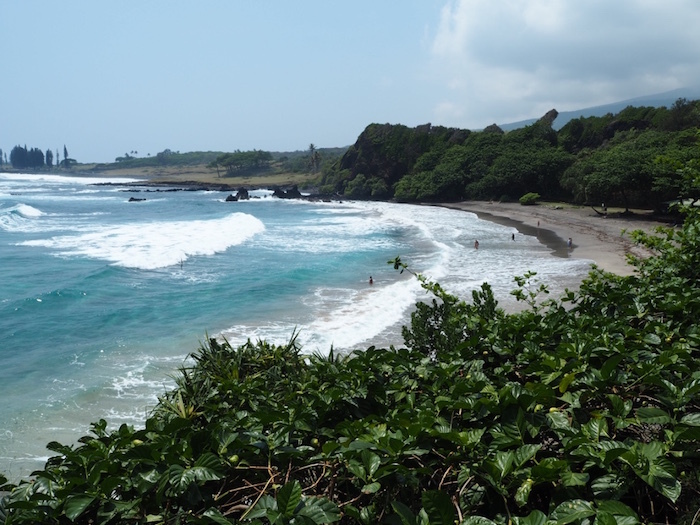 Hamoa Beach (mile marker 51) – This is a great place to stop for your picnic lunch. It’s a beautiful beach with plenty of surfers catching the waves. If it’s not too rough, it’s a great place for a quick dip. Great view for a picnic! 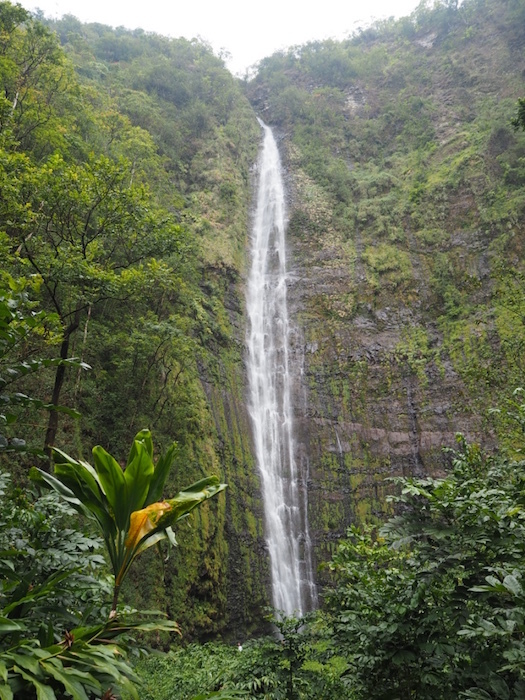 Wailua Falls (mile marker 45) – Yet another stunning waterfall by the side of the road. The falls are easily accessible with a trail leading down to the base from the right side of the bridge. There are a few parking spots. 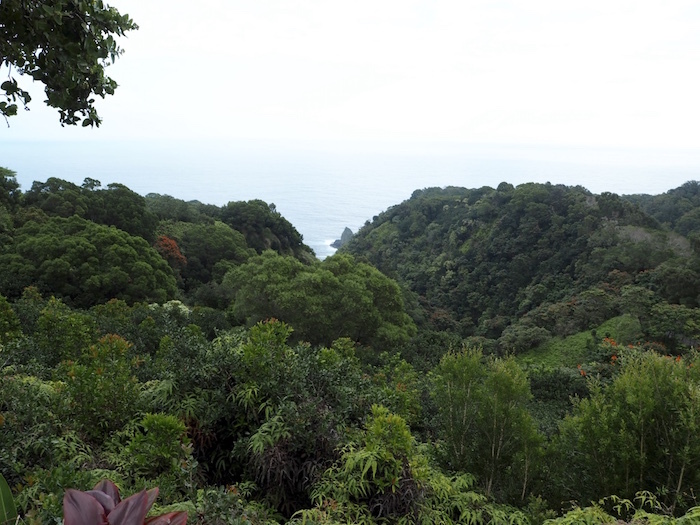 Oheo Gulch and Pipiwai Trail at Kipahulu (MM 42) – This was our last stop on the Road to Hana. This area is part of the Haleakala National Park. If you haven’t been to the crater yet you will need to pay the national park entrance fee of $10 per car, which is valid for three days. 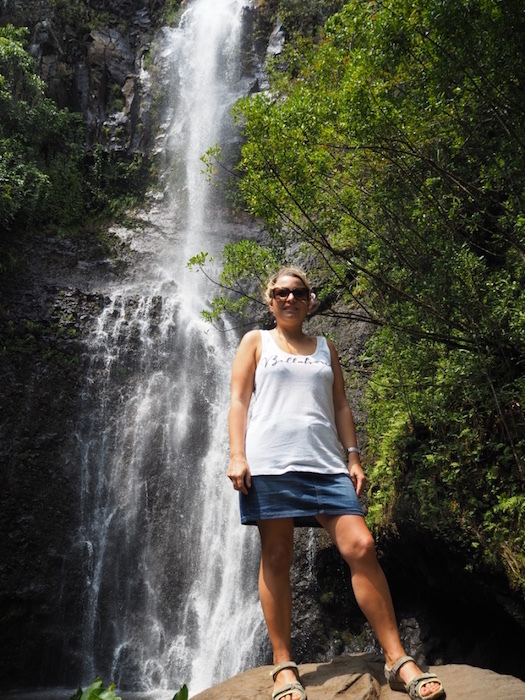 We started by hiking the Pipiwai Trail which was a great hike (two miles one way) going through rainforests, waterfalls, pools and an amazing bamboo forest, and finishing at the impressive Waimoku Falls. We also took the shorter Kuloa Point trail which took us to Kuloa Point and to the mouth of Oheo Gulch. Sadly all the pools and waterfalls in the park were closed for swimming at the time. From here you can drive further on along the back road instead of turning around. All of the hire car companies forbid you from taking the back road however. You drive it at your own risk. We decided not to. Start early! As I said before there is so much to see. We were staying in the Wailea area and left at 6.30am. I feel like we did ok with timing and we managed to see everything we wanted to, and we still managed to spend three hours in Oheo Gulch for hiking. Bring snacks, lots of water and a picnic for lunch. You will save time by having a picnic and there are so many beautiful places along the road to stop and enjoy the view. If you suffer from travel sickness don’t forget to take some travel sickness tablets. You will need them! Bring rain jackets. It didn’t rain on the day we went but the Road to Hana has a reputation for unpredictable weather. It’s better to be safe than sorry. Be sure to fill up your tank of petrol before you start. There is no petrol station between Paia and Hana. Preferably fill up before Paia as Paia’s petrol station is pricier. Make sure your camera is fully charged and you have lots of memory on your card. You will take many many photos along the way. Make sure you drive back before sunset. Believe me you don’t want to be driving those windy roads in the dark. We left the Oheo Gulch at 4pm and arrived back in Paia by 6pm just in time for sunset. You will get more time in summer. Driving back before dark also means that you get to enjoy the view from the other direction. If you have time you can make an extra few stops that you missed on the way up. Let the locals go past you if you are a bit slow on the road. They know the road and they drive way faster than us tourists. Bring comfortable shoes especially if you are planning to do some of the hikes. Bring some dollar bills if you want to buy some fruits or banana bread along the way. Of course drive carefully -yes it’s pretty but the driver needs to keep their eyes on the road! Last but not least, before we went I bought the Maui Gypsy Guide app on my iPhone. It was a great purchase, with commentary along the way and it tells you about the best stops and the history of the region. And you don’t even need Wifi as it uses your phone’s GPS. We definitely recommend driving the Road to Hana. It’s so beautiful and a lot of fun! While it’s a long day, it is totally worth it!